With over 160 skiable acres, Camelback Mountain Resort is the largest of all the ski resorts in the Poconos. 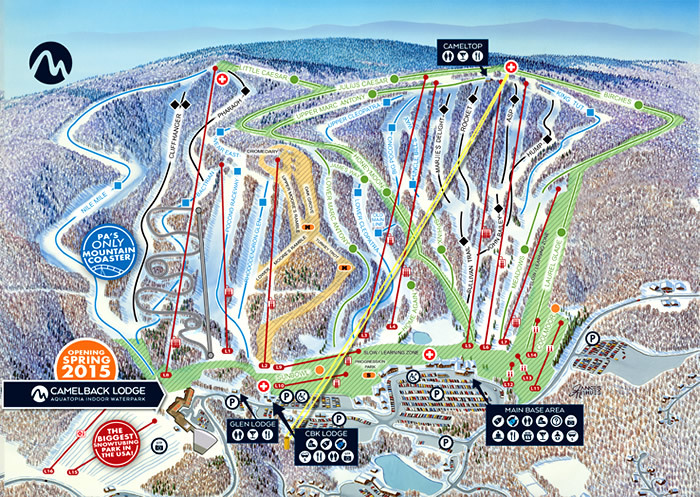 Its ten lifts service over 30 named runs, and four carpet lifts help make this perhaps the best Poconos ski resort for learning how to ski. Camelback Ski Resort advertises its educational programs, and beginner skiers will find a number of long green runs, some of which double as mountain traverses. But with 800 vertical feet rising to over 2,100 feet elevation, there are a number of fairly long expert-level run—several around the high-speed Sullivan Express and several served by the Stevenson Express, including the double-black-rated Cliffhanger. Intermediate skiers will be most entertained by the mile-long Nile Mile run off the Stevenson. At the center of the mountain, Camelback Ski Resort boasts several large terrain parks and a half pipe. True to its reputation as a good place to learn to ski Camelback also has a beginners terrain park below its larger freestyle areas. The best moguls are off the Bailey Lift double chair. 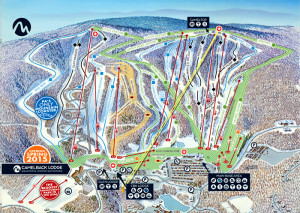 Camelback Ski Resort Trail Map. Clickenzee to embiggen. On a weekend, the line at the quads can be quite long. Start by skiing on the Sullivan, and when this gets busy head to the Stevenson. If they are both busy, check out the doubles, which have shorter lines and don’t take too much longer to get up the mountain. Camelback Ski Area opened in 1963 with 3 lifts and 14 runs. It was situated just to the left of an existing (but now defunct) ski area, the Big Pocono Ski Area. (Room for expansion?) Its expansion and improvement has been steady. The high-speed Sullivan lift opened up in 1993; the other high-speed lift, Stevenson, opened in 1994, giving Camelback Ski Area a slightly higher vertical. The past few years has also seen an expansion of summer activities, with an indoor water park (opened in 2015) and a rollercoaster. Two lifts serve ten tubing runs.